Momba launches its dorm-essential vending machine in Quincy House. Founded by a Harvard graduate, the company pledges to contribute at least 10% of profits to student financial aid. 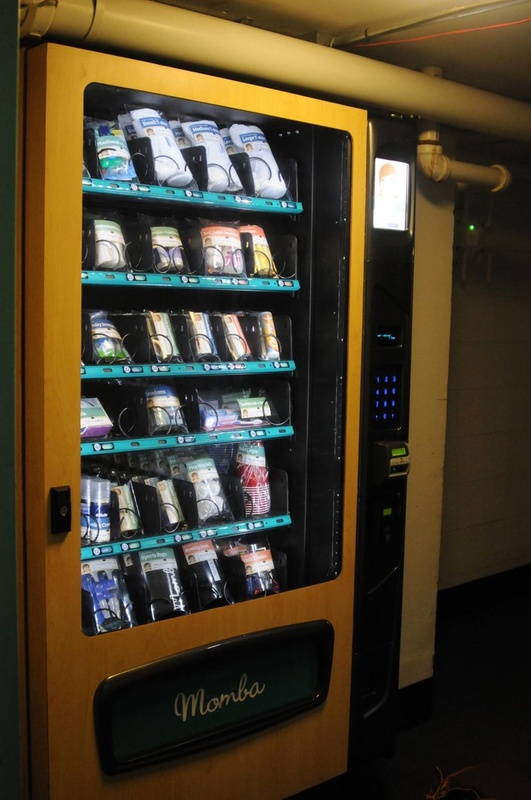 Tampons, toothpaste, and condoms have taken the place of potato chips, candy bars, and water bottles in a vending machine in the basement of New Quincy that was installed this Monday. The Quincy dorm-essentials vending machine is the first launched by Momba, a new entrepreneurial venture launched by Steven R. Duque ’09. The company’s name, according to Duque, the company’s founder and CEO, describes it’s product’s role as a “second mother” in caring 24/7 for students’ needs. The machine installed in New Quincy will be the first of two placed at Harvard before Duque expands to other universities in the Boston area. A second machine will replace a Coca-Cola machine that was moved out of Weld Hall on Wednesday. Duque, a former Quincy resident who built the machine with his wife and CFO Heather, said that Momba aims to be a safer and more convenient alternative to CVS, a seven-minute walk from New Quincy. “I know [safety is] not top of mind for all students, but from administrators’ and parents’ standpoints, this is great,” he said. Students said that the vending machine’s installation will be an asset in terms of both convenience and safety. “Any measure to increase student safety and to reduce students walking through late night streets is a good measure,” Akshay M. Sharma ’14, an Undergraduate Council representative from Cabot House, said. According to Duque, the benefits of Momba extend beyond convenience and safety. Duque, who said that he is committed to philanthropy in business, has pledged to contribute ten percent of profits to the host schools’ financial aid programs. Students said that this would provide additional incentive for using the Momba machines installed on campus. Having relied on financial aid while at Harvard, Duque said he is dedicated to making a positive impact on the communities at host schools by contributing towards financial aid endowments and providing students with entrepreneurial exposure. With help from students at future host schools, Duque is preparing for Momba’s debut beyond Harvard. Students at Boston College, Boston University, and UMass-Amherst are already promoting the machine in return for performance-based compensation.